Poet Nickole Brown: Honestly, I wasn’t sure. One thing I try to do when I publish a poem is to give up the control over it; I mean, there’s a way in which the poem is mine and comes from me, but after it’s out in the world, I no longer “own” it. It’s kind of like having a child—that kid is yours and you’ll always be her mother, but someday, she’s going to move out and have a life of her own. Artist Karen Cappotto: The heroic journey of a woman. Poet Nickole Brown: There’s an element of ferocity and anger in that bright red form; the collaboration brings out those deeper, darker undercurrents—those of my grandmother as a woman trapped, of a woman fighting against a world with so few choices for her. Artist Karen Cappotto: I was in NYC at the time I got the poem, and the idea of the American dream and the immigrant’s journey came to the fore, now I am responding to these questions from an artist residency in rural Vermont—the language of earth feels lush here. Designer Debbie Nadolney: I wanted to add a little of my voice towards making cohesive the elements of brilliance that were already there. Poet Nickole Brown: While many of those dark emotions are certainly present in the book as a whole (which is entirely about my grandmother’s life), I didn’t think they were present in just this short excerpt, which is part of a longer poem in five sections. It’s sometimes surprising to see what others find between the lines of your own poems. Artist Karen Cappotto: How uncomfortable I felt. Poet Nickole Brown: I’m ashamed to say I haven’t. My wife, Jessica Jacobs, is publishing a book this spring that’s almost entirely ekphrastic (it’s based on the life of Georgia O’Keeffe), so perhaps I should take her lead. It’s certainly proved a fruitful source of inspiration for her. Artist Karen Cappotto: I often find the key for a painting in a book just when I need it most. Poet Nickole Brown: Vinculum. It’s a word I never get to use, but now I have my chance. It’s a strange and stiff little term from math that basically names a mark that yokes a formula together. For me, this is a fancy way of saying that now that the poem and the art have been put together, they’ve been changed by the dynamic and are bonded together by the collaboration—made into something new. Poet Nickole Brown: Something nostalgic but unexpectedly fierce; something with equal parts sweetness and resentment. Maybe “Sweet Lorraine” by Patty Griffin. Artist Karen Cappotto: “Song for Zula,” by Phosphorescent. Poet Nickole Brown: I’m wrapping up a busy semester with my students, so the best books I’ve had time for are the ones I’ve taught: Rookery by Traci Brimhall, Shoulda Been Jimi Savannah by Patricia Smith, and the classic The Great Fires by Jack Gilbert. I already have my stack ready to go for the summer though, which includes some good Southern stuff (a biography of Tennessee Williams and a collection of letters by Flannery O’Connor) and a few random treats, such as Helen Macdonald’s H is for Hawk. Artist Karen Cappotto: Companion Grasses by Brian Teare. It’s a page turner. Artist Karen Cappotto: Of course! All the artists participating at the March 2015 residency I am currently a part of at the Vermont Studio Center opened their studios last night… the work I was privileged to see was extraordinary! Designer Debbie Nadolney: Recently, the Robert Gober at MOMA … Amazing! 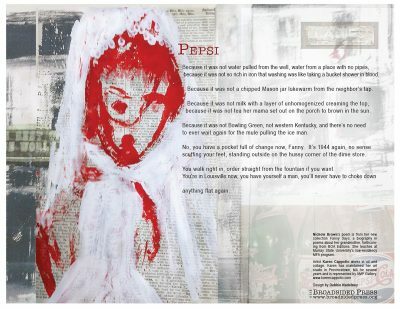 Artist Karen Cappotto: Pepsi… in this case, what sparkles is dark. And thank you for inviting me to be a part of Broadsided Press! Poet Nickole Brown‘s poem is from her poetry collection Fanny Says, a biography of her grandmother. Her books include her debut, Sister, a novel-in-poems, and an anthology, Air Fare, co-edited with Judith Taylor. She has received grants from the National Endowment for the Arts, the Kentucky Foundation for Women, and the Kentucky Arts Council. She is the Editor for the Marie Alexander Series in Prose Poetry. Nickole lives with her wife, poet Jessica Jacobs. “I thought it might be fun to post the broadside on a chicken coop. I mean, has anybody ever vectorized a hen house before? Here I am with Inga (the black chicken) and Blondie. Somehow, this made me fantastically happy.” Lawrence, Kansas. “Pepsi” on the wall of Karen’s studio at the Vermont Studio Center, in conversation with new work. Designer Debbie Nadolney Vectorizes while in New Orleans.